Visual Comparison Tool is an important component of Version Control process in Pics.io. Much in the same way as Comparison Tool works with static images (jpg, png, Sketch, etc. ), it works with video assets, too. Every time you upload a new revision of your asset in Pics.io, these versions are stacked on top of each other in a chronological sequence. Visual Comparison Tool helps you to compare two different revisions of your video asset. 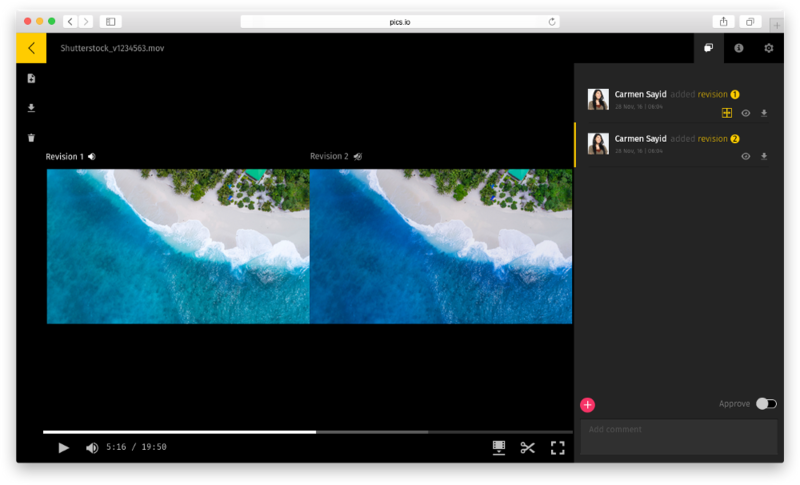 Instead of opening one file at a time, you can open two video files together and play them simultaneously. In this way, you can see the difference between two revisions much more clearly. Choose one more revision that you want to compare with the first one, and press Comparison Tool button next to it. Two video revisions will be placed side by side and played simultaneously with a common timeline. You can move the bullet on your timeline to compare a specific moment in the video. You can also mute either of the videos to hear only one sound track at a time. Here's a short video that briefly shows you how you can use Visual Comparison Tool for video assets. NB Please note that Visual Comparison Tool for video files currently works only for WEBM, MP4, M4V, F4V. Revision Approval which can be of great help if you work with your video files in a team. Comparing two different assets in Pics.io.